What is the Best Anti-Vibration Material? What Two Properties Does the Best Anti-Vibration Material Possess? According to the seminal article by J C Snowdon in a 1958 issue of British Journal of Applied Physics, a good anti-vibration material “...should possess a high damping factor which does not increase greatly with frequency, and secondly, that [sic] it should be free from any major increase in dynamic modulus with frequency.” What makes the best anti-vibration material today based on this assertion? Sorbothane®. Sorbothane® is a highly damped, visco-elastic, polymeric solid engineered from a thermoset, polyether-based polyurethane. It has superior damping capabilities over other elastomers. Its low transmissibility means less damage to sensitive components experiencing vibration. It also has vibration isolation properties at large frequency ratios. Sorbothane has a low creep rate, a superior damping coefficient, and performs over a very wide temperature range. Sorbothane combines shock absorption, good memory, anti-vibration control, and vibration damping to make it the industry leader as an anti-vibration material. 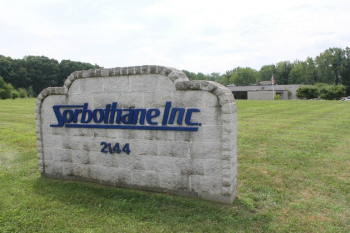 Where Can Sorbothane® Be Used? Sorbothane can be used in nearly any application that requires anti-vibration interventions. It safely dissipates vibrations and most of the associated noise from those vibrations before they can affect human operators. Sorbothane prevents vibrational creep and can absorb some of the vibrations at joinings in some machines. Newer equipment designs feature composite materials with unique adhesives but lack the damping qualities present in traditional adhesives. However, with the insertion of Sorbothane anti-vibration pads or any of the other forms of this material available, damping can be restored without changing the machine’s design or strength and without adversely affecting user safety. 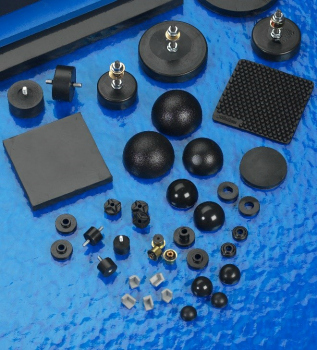 For more than 30 years, Sorbothane has been the trusted choice of engineers worldwide for anti-vibration materials. Since its beginning, Sorbothane, Inc. has been recognized for producing superior American-made products that protect and improve the quality and enjoyment of life. How do we do that? Our engineering staff is committed to helping you design the ideal damper or isolator for your product by using only the latest in 3D CAD software and technology. Our in-house R&D lab tests and verifies the shock-absorbing performance of our products. Our 64,000-square-foot, state-of-the-art manufacturing facility features low-cost tooling capabilities, fast prototyping, and short lead times to provide the most cost-effective solution for low, medium, or high volume needs. We take pride in delivering the highest quality products and strive to exceed all expectations. Would Sorbothane be a good fit for your project or application? Our engineers can work with you to develop an anti-vibration solution that will work best for you. Request a quote today.